New Delhi: The Vice President of India, Shri M. Venkaiah Naidu has said that Women’s education should become the cardinal principle of Nai Talim and said education should empower the society to dispel gender stereotypes. 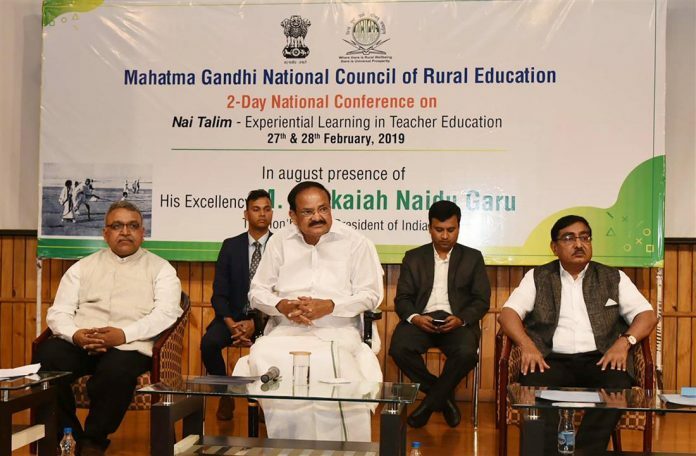 Saying that education was a key element in the rural transformation that Gandhiji dreamt of, Shri Naidu wanted institutes like the National Council of Rural Education to take steps to enhance the quality education in rural areas. He opined that aspects such as bridging the rural-urban divide and the Gandhian ideal of Gram Swaraj should form part of the syllabus. Addressing the 1st National Conference of Educators for Nai Talim and Experiential Learning at the Mahatma Gandhi National Council of Rural Education, in Hyderabad today, the Vice President emphasized that the nation simply cannot realize its full potential if half of the population is not able to contribute meaningfully to economic development and are not given opportunities for personal fulfillment and career growth. The Vice President said that education must foster active citizenship in the world of today and prepare the young children to be forward looking pace setters in the world of tomorrow. He opined that the education system would lose relevance if it is not organically connected to a society’s present and its future. Quoting the former President Dr. APJ Abdul Kalam, the Vice President said that bridging the rural-urban divide was closely linked with the mission of overcoming poverty and inequity. Shri Naidu said that driven by the need for education, health care and better income, the rural population was migrating to urban areas with a hope to get better livelihood opportunities. Concerned over the trend, he said such migrations often results in despair and contribute further to urban poverty and led to stress and societal turbulence. Commenting on present day disturbance of terrorism, the Vice President said that terrorism in any form should be eliminated. The Vice President opined that by creating urban amenities such as affordable healthcare, access to clean water, lending support to rural livelihoods, nurturing the unharnessed resources and potential would help in bridging such divide. Saying that the gender divide and rural-urban divide often coincide, Shri Naidu stressed that special attention must be paid to girls’ education, especially in rural areas. Basic education must be in mother tongue, he added. The Chairman, MGNCRE, Dr. W.G. Prasanna Kumar, the Chairman, TSCHE, Prof. Papi Reddy, the Vice Chancellors, the Heads of Departments from a number of Universities, and representatives of the State Councils for Education, Research and Training were present on the occasion. “I am very happy to be with you all on the occasion of 1st National Conference of Educators for Nai Talim and Experiential Learning. Nai Talim, literally ‘New Education’, a Gandhian approach to basic education, is a holistic one, where all aspects of the individual—intellectual, physical, social, and spiritual—are cultivated in a curriculum. It integrates learning with hands on work that thoroughly prepares and equips young people for their life in the world, rather than isolating them from the “real” world and surrounding community. I congratulate Mahatma Gandhi National Council of Rural Education under the Department of Higher Education in the Ministry of Human Resource Development for taking up this bold initiative of promoting Gandhiji’s Nai Talim on his 150th Birth Anniversary. I am told that a number of universities are now using the Nai Talim scheme for teacher education and many more are set to adopt it. I am happy to know that Vice Chancellors, Heads of Departments from a number of Universities, and representatives of the State Councils for Education, Research and Training are participating in the conference to discuss Nai Talim. This effort of reaching every State and Central University to impact teacher education and working with every State Council of Educational Research and Training to impact school curriculum would definitely make a huge positive impact. It is heartening to note that the aims of this conference is complimentary with those of the Government of India’s contemporary endeavor of skilling the Indian Society at various levels through flagship programs like Skill India. The National Council of Rural Education has an important role to pay in enhancing access to quality education in rural areas. Its mandate is to bridge the rural-urban divide and take forward the Gandhian ideal of Gram Swaraj. Education is a key element in the rural transformation that Gandhiji dreamt of. There is a need for re-evaluating our methods of imparting education. We must bridge the rural-urban divide. This council has a great responsibility to work with various educational institutions and planners to bridge this gap. “Bridging the rural-urban divide is closely linked with the mission of overcoming poverty and inequity. About 70 per cent of the world’s extremely poor live in villages and towns. But that is not the complete picture. Driven by the need for education, health care and better income, the rural population is migrating to urban areas with a hope to get better livelihood opportunities, which often results in despair. This further contributes to urban poverty and leads to stress and societal turbulence. Dr. Kalam had envisioned a sustainable development system called PURA (Providing Urban Amenities in Rural Areas). We must shape our development architecture by keeping these factors in mind to build an inclusive India. We often see that the gender divide and rural-urban divide coincide. We may, therefore, have to pay particular attention to girls’ education. Women’s education is a cardinal principle of Nai Talim. Education should empower the society to dispel gender stereotypes. The World Bank identifies female labour force participation in the market at 31.2 percent and says that a staggering 50 million young women in India neither study nor work. Let me emphasize that our country simply cannot realize its full potential if half of the population is not able to contribute meaningfully to economic development and are not given opportunities for personal fulfillment and career growth. Gandhi ji advocated the harmonious combination of the body, mind and soul for the making of the complete man. Achieving this harmony is indeed the essence of education. Not only the harmonious development of different faculties but what is equally important is the ability to live in harmony with nature. We Indians view nature as divine which is why one of the names of Goddess Lakshmi, the goddess of wealth, is “Prakrithi”. It is important to note the choice of words here, especially “Prakrithi” (Nature), “Vikrithi” (Diversity), “Vidya” (Knowledge), “Sarva Bhoota hitapradaam” (Bestower of good things to all creatures), “Shraddham” (Devotion and dedication) and “Vibhuti” (Wealth). The key message which is relevant for all of us today is that nature in all its diversity showers its blessings on all equally. We have to study it and share the wealth that it bestows on us with devotion and dedication. This respect for nature and an aesthetic appreciation will have to be reinforced in our education system. This ties in with Gandhiji’s vision that ‘nature provides enough for man’s need but not for his greed’. The education system loses relevance it is not organically connected to a society’s present and its future. It has to foster active citizenship in the world of today. Equally important is to prepare our young children to be forward looking pace setters in the world of tomorrow. Gandhiji believed that education should also teach children essential values, especially the value of cleanliness and personal hygiene. It is his vision of a clean India that inspired the Swachh Bharat Mission, a Jan Andolan of massive proportions. Cleanliness should become a way of life. Morals and values could be taught through song, dance and drama and through stories from the lives of great thinkers and social reformers. More importantly, the teacher’s behavior and his or her interaction with students leaves the greatest impression on young minds. The teachers must always keep this in mind and ensure that they serve as role models. Children have an innate curiosity to learn new things. Education should nurture and nourish this spirit of enquiry and not stifle and extinguish it. Education should also inspire qualities of compassion, internationalism, peace and tolerance. For a democratic society that is rooted in peace to flourish, schools and colleges must nurture values of humility, righteousness, inclusion, integrity, and empathy. There is a need to reintroduce various aspects of the Nai Taleem scheme of education in all schools in the country. There is also a need to reorient the teachers, curriculum developers and teacher education institutions in this direction. Another emphasis that is now needed is a good knowledge of mother tongue. In fact, I feel that we should have primary education in the mother tongue of the children. This will ensure that the concept formation is sound, expression of ideas is refined and a strong foundation for further learning is laid. Gandhi ji taught us to go to the villages of India and strengthen bonds through service. 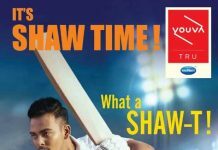 Nai Talim is designed to produce responsible, empathetic citizens who will look upon all kinds of useful work including manual labour as honorable and dignified. Education planning needs to be undertaken with rural Indian population in mind. Visits to village, spending time listening to agriculturists and educating them about the latest agricultural practices should be an integral part of education. A school is very much a part of the community and the community’s engagement in terms of owning and managing of school needs to be enhanced. We also have to invest significant amount of resources in training teachers to make them highly competent and responsive. We have to equip prospective teachers with the knowledge, attitude and skills they require to perform their tasks effectively in the classroom, the educational institution and wider community. Education is changing and we need teachers who can adapt to the rapidly evolving learning environment. True education opens up one’s mind and trains one to think critically, practically and creatively. It hones the interpersonal skills and inculcates a sense of social responsibility. It fosters empathy, kindness and humility. Education at its best, makes one a better, well rounded human being. Education makes each one of us a more thinking, a more feeling person. That’s the holistic perspective advocated by Gandhiji and we must be able to integrate this perspective into our educational system. I hope that those engaged in the noble cause of educating young minds will succeed in moulding youngsters into true assets of the world. I wish all of you the very best!